Home office, bathrooms, laundry spaces, basement bar areas and entertainment centers can become gorgeous focal points around your home. 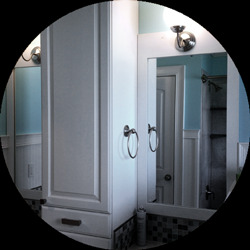 We can help you bring a new level of beauty and organization to virtually every room. We feature not only great decks, but also hot tub surrounds, patio covers, gazebos and trellis, privacy screens, benches, concrete patios, fences, additions and remodels.